I don’t know if I’m just suddenly aware of the number of Star Wars novels on the market or if there’s been an increase in their number (due, mostly likely, to the new films coming soon) but out of curiosity (and the fact that I so enjoyed the James s. A. Corey novel), I requested this one. If you’ve been living under a rock and aren’t familiar with the Star Wars films, Tarkin was one of the major bad guys in the original film (later numbered “episode IV”) played by the incredible Peter Cushing. Tarkin appeared again, later/earlier, in episode III (played by Wayne Pygram). And although one of the major bad boys, he was quite over-shadowed by Darth Vader. 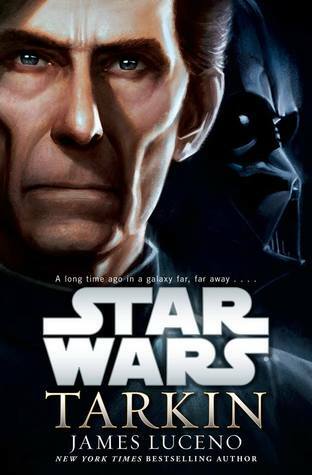 Now, thanks to author James Luceno, Grand Moff Tarkin gets his own story. What I like about a book like this is that we readers already have a basic understanding of who the character is so the author can get right in to telling a story. But unlike some of the other characters from the film, who are so well-known, the readers have such a strong sense of the character that any deviation from how they act (or at least how the reader thinks they should act) can spoil the book (see my reaction to Razor’s Edge by Martha Wells). This book nicely follows Tarkin, a known and respected commander, as he climbs the ranks, next to Darth Vader, under the emperor. We get a sense of his decision-making and his ability to quickly judge the costs of friendly casualties as he pursues his goals. One moment, however, felt false. Throughout the book, we see Tarkin in action, but near the end of the book, author Luceno resorts to a chapter of back story narrative. Tarkin tells Vader his story. At one point Tarkin even notes that it seemed strange to be having such a personal conversation with Vader, but it doesn’t stop Luceno from having Tarkin deliver the monologue. While the story was somewhat interesting, it would have been so much more so if we could have experienced it. Seen it. Rather than having it told to us. It comes across feeling as though Luceno had this great moment he wanted to include but couldn’t find any other way to get it in to the book and as he was approaching the end of his story, he needed to get it in quickly. This moment spoiled an otherwise well-told tale. Looking for a good book? Star Wars fans will appreciate this character study of one of the franchise’s more recognizable but unknown villains – Tarkin by James Luceno. I received a free copy of this book from the publisher, through Netgalley, for an honest review.